Famous for its satellite GPS products, Garmin’s (GRMN) transition from its basics to smart wearables has made it one of the top performing companies in the technology sector. The company seems to have made the right move by drifting from GPS to a more consumer-wide market. The company not only boasts of diversity in product portfolio but also geographically — something that helps Garmin stand out among its rivals. Technology is at the forefront in all Garmin’s segments, be it outdoor, fitness, marine, auto devices, and aviation units. Garmin’s key to success in 2017 was not just the launch of a couple of hit products, but the fact that the company launched several new products through its business units. Strong revenue growth from its newly launched products indicates that the company has clearly found its path and is adapting well to the growing demands of the customers. Interestingly, the company expects to maintain the same momentum this year as well. Garmin’s outdoor segment is leading the charge in the company’s strong financials. The company has been expanding this segment for some time now. In the last quarter of 2017, outdoor segment jumped 16% with most of the contributions pouring in from the wearables devices. Garmin expects this segment to be the growth segment even in 2018. Unlike its rival like GoPro who failed to convert its action cam customer base to other products, Garmin found it easy to launch new products. The Fenix 5 line of watches launched in 2017 was quite successful on the market. Significant growth in the outdoor segment in the fourth quarter was mainly due to the growing demand for Fenix. Last year, Garmin reported a 2% bump in its revenue. This is a big advantage, given that Fitbit — the king of wearables — saw its full-year revenue slide 26%. Besides, Garmin has zero debt and is still a free-cash-flow cow. The company has a lot to offer to its investors. This excess of cash can be used for more R&D. 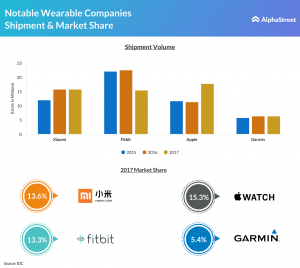 Garmin looks like it has cracked the secret to gain traction in the wearables industry that was otherwise dominated by major players such as Apple, Fitbit, and GoPro.